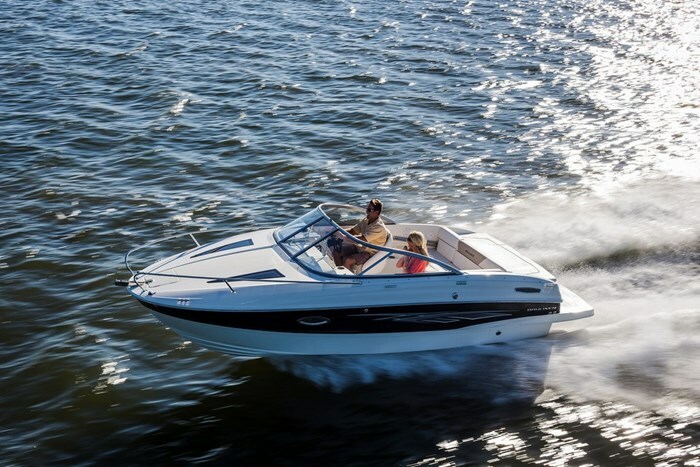 The 642 Overnighter is new for 2014 and the larger of two cuddy cabin models from Bayliner Boats, a Brunswick Corporation company. Bayliner has been building boats for over fifty-five years. 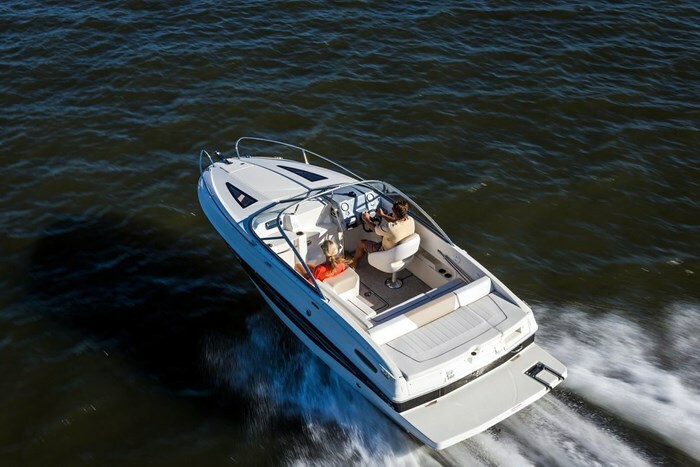 This new model is one of twenty-three models of bowriders, deck boats, cuddies, and cruisers from sixteen to almost thirty-three feet offered for 2014. A full-width transom sunpad on the 642 Overnighter allows for comfortable seating or lounging above the large integrated swim platform equipped with a flip-down telescoping boarding ladder and stainless steel ski-tow eye. The starboard third section of this sunpad tilts up to allow even more comfortable stretched out lounging. This same padded section then hinges right up and over, and by removing the rear bench seatback and bottom cushion on that starboard stern section, allows walk-thru ease of access to the cockpit. About two-thirds of the entire rear bench seat plus the entire sunpad is hinged as one piece for easy engine inspection and maintenance and additional engine compartmentalized storage areas are provided. This rear bench seat is part of one large L-shaped lounge that stretches almost all the way from the passenger helm down the port side and joins this rear bench providing plenty of seating and lounging possibilities. A flip-flop backrest allows for a forward-facing seat at the passenger helm or as a backrest for rear-facing lounging. A large, folding, teak cockpit table is optionally available and would be a most convenient addition for your 642 Overnighter. The entire portside cushion of this lounge seat hinges up and forward with gas-assist struts giving access to another large storage compartment below. Unusual in most other cuddy cabins, more storage is found in a cockpit in-floor compartment. For peace of mind, the cockpit fibreglass inner liner is self-draining. 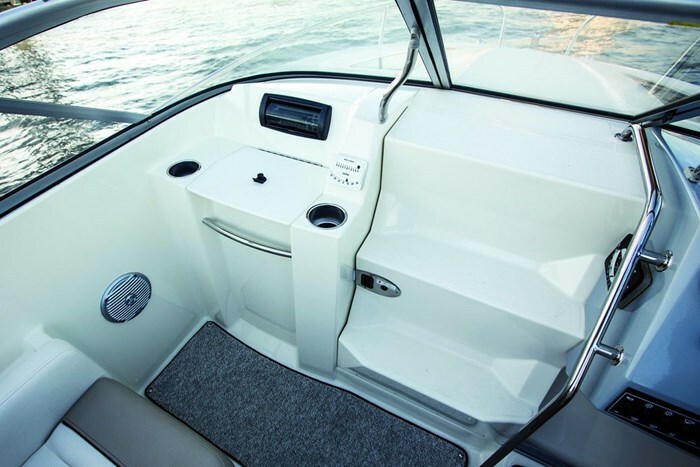 A high, curved walk-thru windshield with side wings which extend right back to the rear bench seat provides lots of weather protection for passengers while a sliding cabin door contains molded-in steps for easy access to the foredeck, aided by a substantial safety grab rail. A clear walkway is provided from this windshield forward to the very large foredeck anchor locker since there is not the normal opening deck hatch to obstruct the passage. In more European fashion, the bow rails are not joined at the bow leaving about a foot of clearance for easier anchoring and line handling. Instead of a foredeck hatch, twin stylish foredeck skylights plus two hullside portlights provide natural lighting into the cuddy which is designed to sleep two adults. This cuddy is completely fibreglass inner lined, including the ceiling, for ease of maintenance. Storage shelving behind full-length side bolster padding will keep items from falling onto the berths. A portable head that fits in the centre aisle between the berths is optionally available. The passenger helm console has another substantial safety grab handle, two cupholders, and a top-loading very large storage compartment/cooler. The standard waterproof 120-watt AM/FM stereo with audio input for iPod and MP3 is located on the front side of this passenger helm. 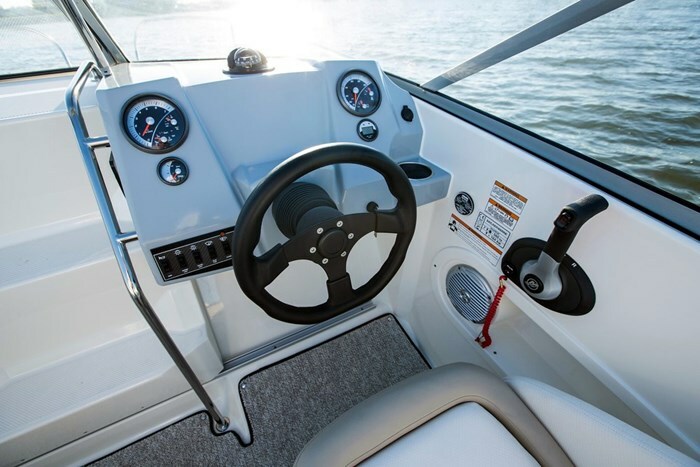 The captain sits in an adjustable bucket seat with flip-up bolster and grips a padded tilt steering wheel. Two new and large, chromed, anti-glare multi-function gauges and two smaller gauges border a large blank centre section of the instrument dash which is reserved for installing your choice of optional navigation electronics. Standard instrumentation includes the normal speedometer, tachometer, fuel, oil pressure, temperature, and trim gauges. Standard sterndrive power for the 642 Overnighter is supplied by a 135 horsepower MerCruiser® 3.0L MPI (Multi-Port Fuel Injection) with Alpha 1 outdrive. 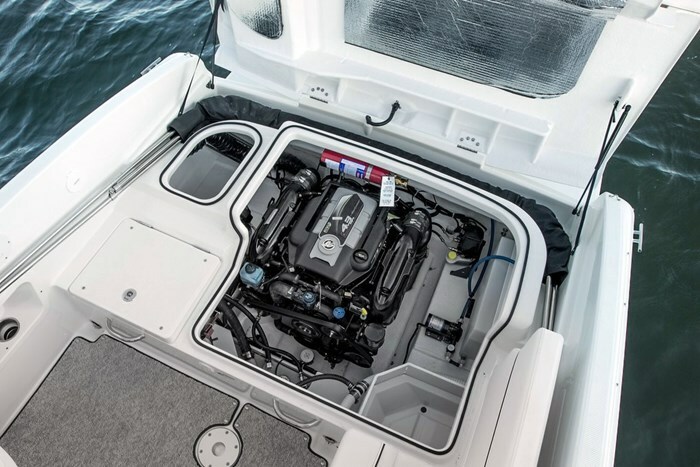 Optional power is a 220 horsepower MerCruiser® 4.3L MPI with Alpha 1 outdrive. Other notable optional equipment includes a bimini top which will stow behind and under the stern bench seat and perhaps you will want the full camper canvas to allow you to more conveniently extend our Canadian boating season. 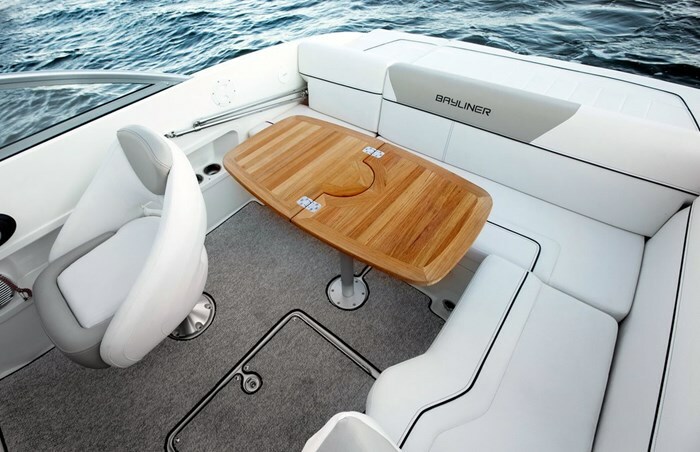 A Preferred Equipment Package provides carpet runners, the aforementioned teak cockpit table, portable head, and stainless steel upgrades for your cupholders, fuel fill and vent, plus thru-hull fittings. You can also upgrade your hull and/or interior colours, upgrade the captain’s seat, and add a foredeck sunpad, cockpit cover, in-dash digital depth finder, plus a convenient sink with faucet in the passenger helm which also adds a transom shower. There are also three choices of trailers available. The 642 Overnighter – great for a day trip or a weekend getaway.